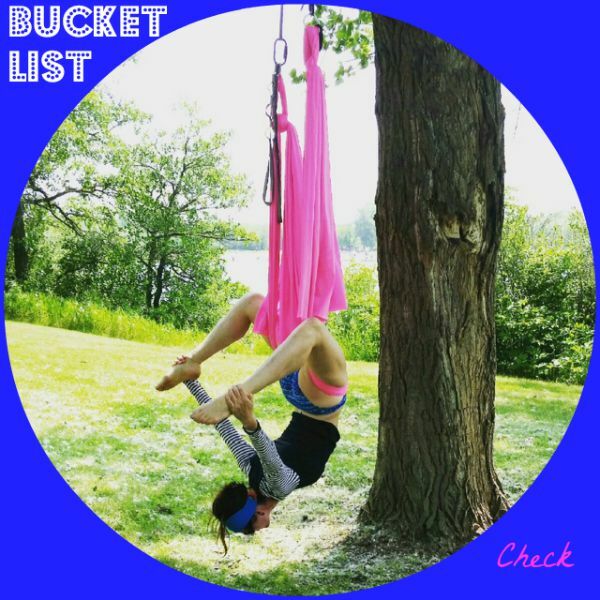 MamaEatsClean: B12, Probiotics and Yoga from a Tree. B12, Probiotics and Yoga from a Tree. Yoga from a tree. Check. Its been a while. A long while since I've checked in. This is the first day in months and months.........and months that I have felt like myself. Finally, hallelujah! I've been just going through the motions. I'm not ill. I don't look bad (well not all the time). But I just haven't felt like myself. Sluggish some days. Moody others. Low energy. My digestion has been all over the place. It started this winter with a bad (like really bad) flare up of IBS and what I think was one of my first "fibromyalgia" attacks. Or at least the first time I actually recognized it. I hadn't changed anything in my diet to trigger it. I had been eating clean, exercising and had minimal stress so it was perplexing and extremely frustrating. Thankfully, I stumbled across the FODMAP diet for IBS. It worked incredibly well and my digestion improved dramatically and pretty much immediately. Life. Changer. But my immune system had taken a beating and I ended up with "ping-pong" strep throat in June and early July. Twice within a month. It knocked the wind out of my sails. Plus I had to go on two very strong rounds on antibiotics. To say I was freaking out about that is a huge understatement. I had just gotten my stomach back on track. Arghhhhh. That's the short story, Throw in a knee injury, an unexpected bathroom renovation, recurring ear infections for my 6 year old and 3 hour dance rehearsals twice a week. Something had to give. I was tired. So my blog updates had to go. But I'm back. For today. If you are wondering how I got back on track and am back to feeling normal I'm hoping to do a proper post one day with the deets. One day when I feel more confident the new "old" me is here to stay. But I think it might be from mega probiotics, getting my iron levels back into shape and getting back for routine B12 shots. I B12!!! I'm not looking for sympathy. Don't feel sorry for me. I know lots of people are going through much more difficult times than me. I'm just sharing because sometimes people need to hear ideas (Hello, did I mention the FODMAPS diet and B12 injections HAVE SAVED MY LIFE - or the quality of my life). And I'm pretty pumped to be feeling like myself again. And I'm okay with admitting I struggle sometimes. I'm not perfect. And I don't need to be. In almost every way I live an amazingly blessed life. And even when I'm finding things hard and I'm not my shiny, positive, energetic best I still try and squeeze the best out of every day. So even though I was in NO MOOD for my summer bucket list this year when I originally wrote it out, I went ahead and did one anyway, And I'm glad I did- I've even managed to get through a couple items. Now I'm so excited to tackle the rest with a bit more bounce in my step. I love summer!!! I love FODMAP's(I mean low FODMAPS - you know what I mean - actually you probably don't - google it)!I love B12. I love my aerial yoga hammock.